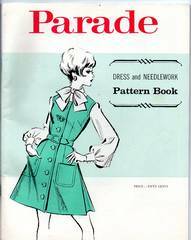 Parade Patterns were featured in U.S. newspapers and available by mail order only. This soft cover catalog has 47 pages of black and white and two-color illustrations of clothing, needlework, home, craft, bazaar and toy patterns. Clothing patterns include women and children. Some charming illustrations.